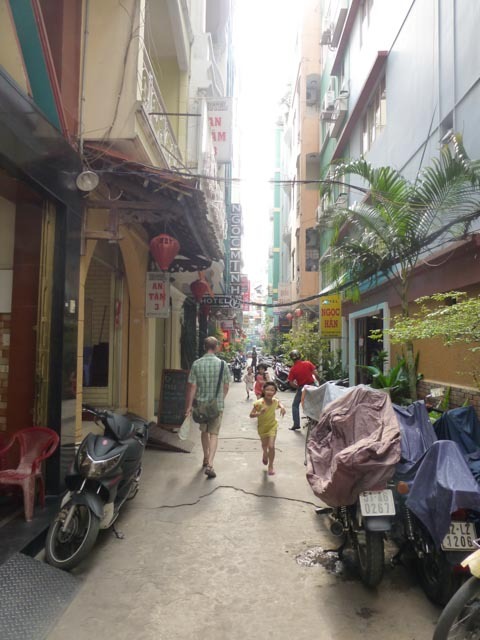 Because of the unstable situation in Bangkok, we decided to spend one last night in Hanoi instead, since we were able to get a connecting flight all the way home from there. 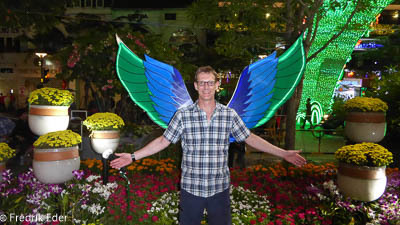 We booked a car from our hotel to Da Nang airport, and the driver spoke very good English and had a lot of knowledge about the area, so we had a great trip and learned a lot. 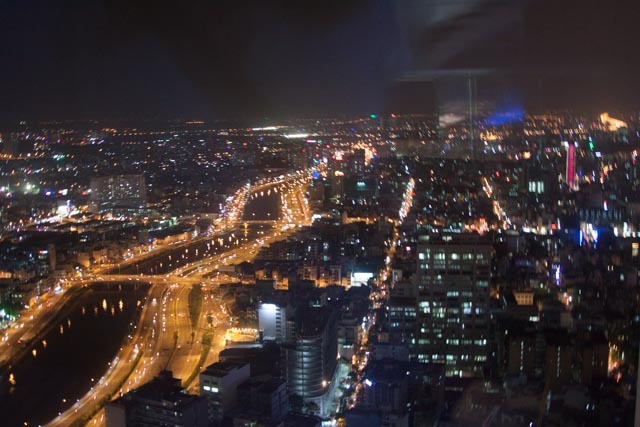 Our flight was 30 minutes late, but we arrived at our hotel in Hanoi at 7 pm. We were welcomed by Dragon, who we knew from our stay there at the beginning of the trip, and were upgraded to an even bigger room than the one we booked. 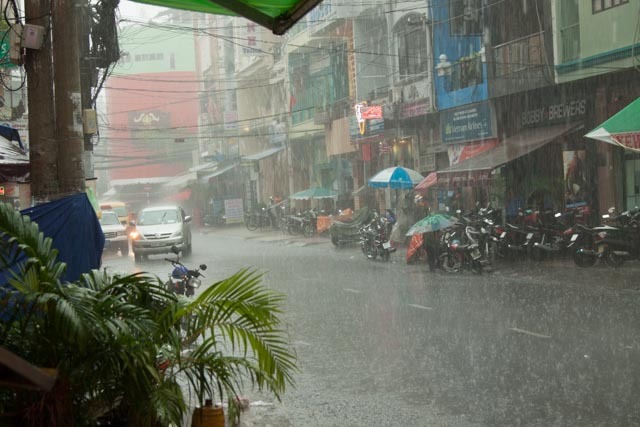 After several days in relaxing Hoi An, it was again a bit of a shock to arrive in Hanoi. Lots of traffic and noise, but this time we knew how to handle it. We went for dinner at our favourite restaurant, New day, where we had duck in orange sauce, shrimps in tamarind sauce and of course some spring rolls. We went to the night market for some last minute shopping, had a beer in a very local bar, tasted and bought coffee at a small coffee shop, and spent the rest of the evening with gin tonics and good music at Rockstore. At midnight they suddenly closed the bar, and we tried to find another bar instead. But it seemed that the entire old town was closed down, and police were walking around making sure everything was quiet. So we ended the evening with a beer in our room instead. The next morning we packed our bags, and with all the shopping we had done, we were actually able to close the suitcases and even had some space left in our hand lugguage! So after breakfast at Le Pub, we did some more shopping at silk street and Hang Da Market. 😉 We also had time for a massage at a posh massage clinique just next to our hotel, before we had to go to the airport at 5 pm. We had our last springrolls for a while, and spent the rest of our Vietnamese dong in the airport shops. We had more time in Bangkok than expected, so we figured that we had time for another massage. Not as posh and relaxed as the last one, but still a great way to spend the waiting time. The flight home was long, but both of us were actually able to sleep a little bit. Still we were quite tired when we landed in Oslo at 6:02 am (45 minutes early, and just 2 minutes after opening time). We were welcomed home by the first snow of the season. Luckily we had new jackets from the tailor, but our shoes were not really fit for winter. 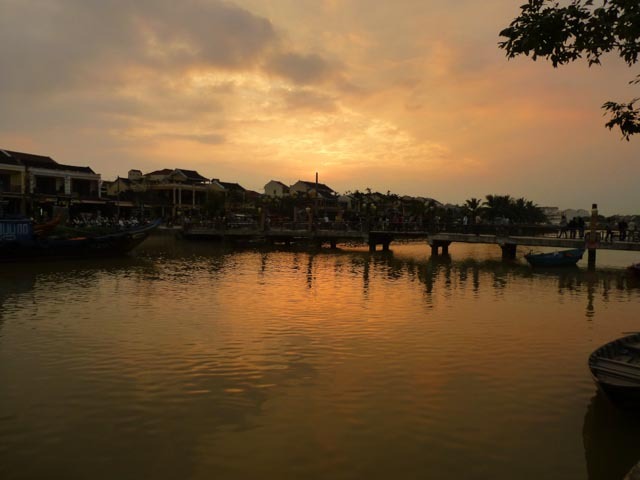 Hoi An is a small city with around 120.000 inhabitants. The old town is car-free, there’s a beach just outside the city, and it’s possible to go scuba diving on Cham Islands. These (in addition to the tailors) were the main reasons we decided to stay here for 4 days. Although the weather was a bit unstable, so we didn’t go scuba diving or to the beach, and the car-free old town had plenty of motorbikes, we’re very happy we had more than a couple of days here. The city is a lot more relaxed than most other places we visited, the people are very sweet, the local food is delicious and the old town is picturesque with it’s beautifully restored historical buildings. 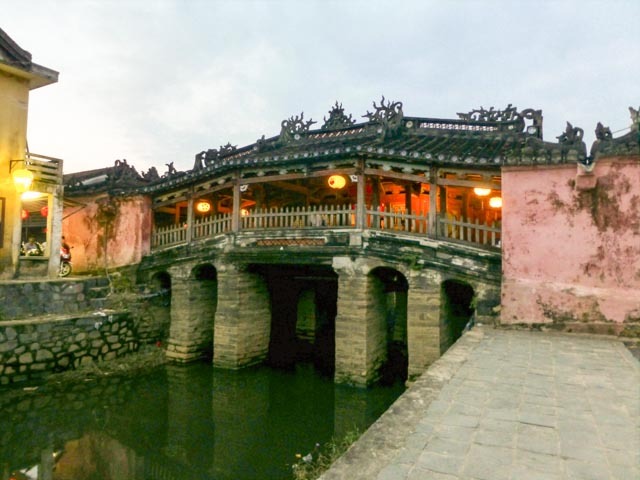 Hoi An has been a major international trading port for more than 2000 years, and the architecture has plenty of foreign influences like the Japanese covered bridge, the Cantonese Assembly Hall, several temples, and hundreds of Chinese-styled shophouses. Nowadays these are mainly used by shops selling art, jewellery, ceramics etc. 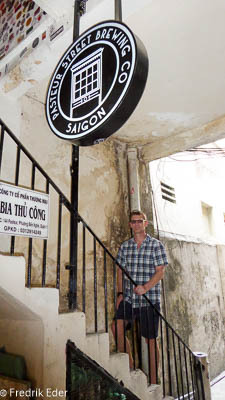 – and of course Hoi An’s famous tailor shops (nearly 400!!). After reading several blog posts and lots of reviews on Tripadvisor we ended up with three tailors we wanted to check out. The first one was very large, looked very high-class, and seemed quite expensive and impersonal. The second one was smaller and felt more our style, but the staff was very pushy and started out on very high prices. The last tailor we wanted to check out was Red Rubik. We got a warm welcome from Trâm, who showed us around. They had fixed prices on everything, and these were lower than the other two tailors, even after bargaining. They had a great selection of fabrics, lots of nice designs on display, and their tailors were working upstairs so it was easy to have small adjustments made. Trâm was not pushy at all, and had no problems with us wanting to go for lunch before deciding on anything. She even showed us a few tricks on how to check the quality, in case we decided to go to a different tailor. After a nice lunch at Secret Garden Restaurant, we of course went back to Red Rubik. We had a few ideas about what we wanted, but pretty much decided on everything there and then. We had no idea there were so many decisions to be made (fabric, lining, angle of pockets, buttons, fitting, trimming, lapel style, length, number of pockets, vents, cuffs etc. etc.). Gunnhild even designed a couple of dresses and a jacket (with a lot of help), based on photos taken in other shops and designs found in their catalogs and magazines. After a while we had more than enough, and spent the rest of the evening by the river, having dinner, a few beers and just watching life go by. We thought we would have plenty of time to enjoy the rooftop pool at our hotel, maybe rent bikes and go to the beach take a cooking class etc., but instead we ended up shopping at two more tailors, one leather tailor making shoes and handbags and one making travel clothing from microfiber materials. And with daily fittings at three tailors, there’s not really much time left for other activities. The fitting process was very smooth. At Red Rubiks they made adjustments while we were trying on the rest of our clothes, which probably saved us a fitting or two. 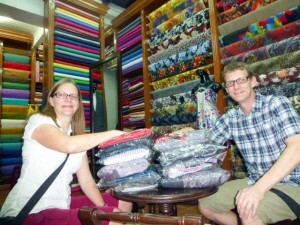 The shop where we bought our travel pants used a tailor that was located a couple of blocks away. When there was a small problem with one of the pants at the second and final fitting, the owner asked Fredrik to look after the shop, and took Gunnhild to the tailor to fix the problem. Sadly it was lunch time, so Fredrik was not able to sell anything while he was in charge. 😉 We were really pleased with all our clothes, and after trying them on we even ended up ordering more. In total we bought 2 dresses, 3 suits, 1 west, 1 skirt, 3 jackets, 2 t-shirts, 4 blouses, 7 shirts, 8 travel pants, 2 handbags, leather sandals and a pair of boots! Phew! Between all the fittings we did have time for a bit of sightseeing, a lot of relaxation, loads of amazing local food and even some local wine (the white one was good, the red one not so much). We had fresh seafood at a small restaurant by the river, lunch at Streets (a restaurant training street kids and disadvantaged youth for careers in hospitality), and dinner at the famous Morning Glory Restaurant. We played pool at the bar across the street from our hotel, made travel arrangements for the rest of our trip, and even bought some christmas presents. 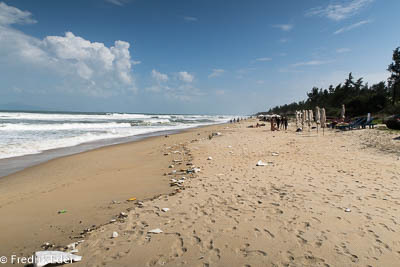 At 10 AM we were picked up by our driver and started our trip to Hoi An. 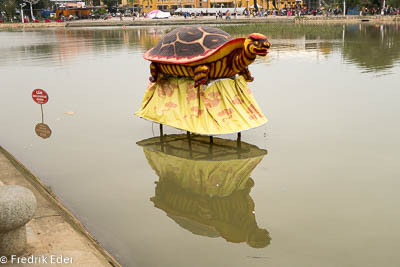 Our first stop was just outside the city of Hue, where we visited the impressive Khai Ding Tomb. 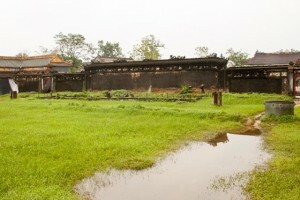 There are 6 royal tombs in the area, but since we had seen quite a few tombs in China, we decided on visiting only one. 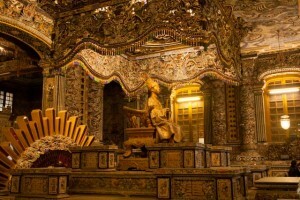 Khai Ding Tomb was built from 1920 to 1931 and is a blend of Western and Eastern architecture. It is located on a steep hill, has several forecourts leading up to the tomb on the top and statues of guards, elephants and dragons. The tomb itself was quite a sight with mosaic, gold, statues and decorated walls and ceilings. As planned we arrived before the tourist busses, and had the place almost to our selves. We continued for about an hour before we stopped for a 30 minute break at Lang Co Beach, a 10 km strech of white sand and a beautiful turquoise lagoon. In this area we could really see evidence of the resent typhoon, with quite a bit of damage to roofs and light structures (like lounge areas at the beach), lots of driftwood and sandbags on pretty much every roof along the road. Instead of driving through the Hai Van Tunnel (the longest tunnel in Southeast Asia at 6.28 km), we took the scenic route over Hai Van Pass. It was steep and curvy, but we passed several nice waterfalls and had great views. 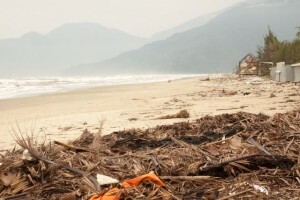 The pass forms a boundary between the climates of northern and southern Vietnam, sheltering the city of Da Nang from the “Chinese winds” that blow in from the northwest. At the top we could see the old gate from the border crossing and some French bunkers, later used by the Americans. In Da Nang we visited the Marble Mountains, five marble and limestone mountains named after the five elements; Kim (metal), Thuy (water), Moc (wood), Hoa (fire) and Tho (earth). We climbed the 156 steps to the top of the biggest mountain (Thuy Son, or Mount of water). 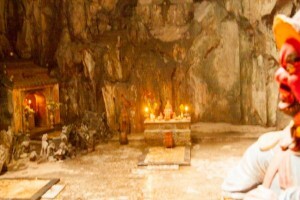 We stopped at Da Loi Tower, Linh Ung Pagoda and three different caves. The most impressing one was Huyen Khong Cave, with several Buddha statues and alters, and light coming in through holes holes in the ceiling. The area around the mountains is famous for stone sculpture making and stone-cutting crafts, and there were thousands of statues in all sizes for sale. 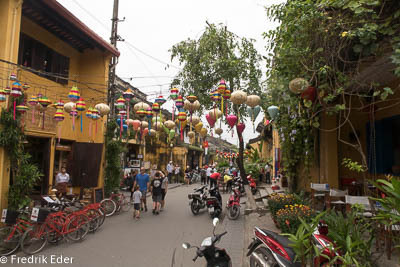 At 3.30 PM we arrived in Hoi An, a city known for it’s hundreds of tailors. 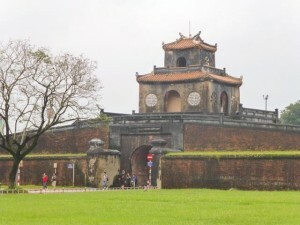 The old town is also a UNESCO World Heritage Site. We were told that the hotel we stayed in had over 1 meter of water in the lobby (flooding) just one week earlier, but everything looked perfect when we arrived. We went out for a small lunch, before checking out some of the many tailors. We quickly realized that we were not prepared at all and had no idea what we wanted, how much it should cost etc. And how do you choose which tailor to use? 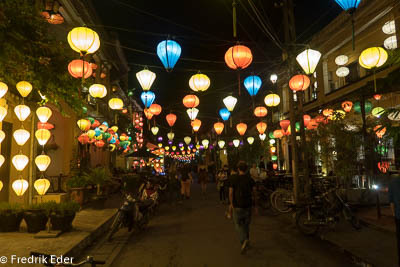 We decided to postpone the problem until the next morning, and spent the night walking around the old town, eating dumplings at a local restaurant and drinking beer while watching the life on and along the Thu Bon River. 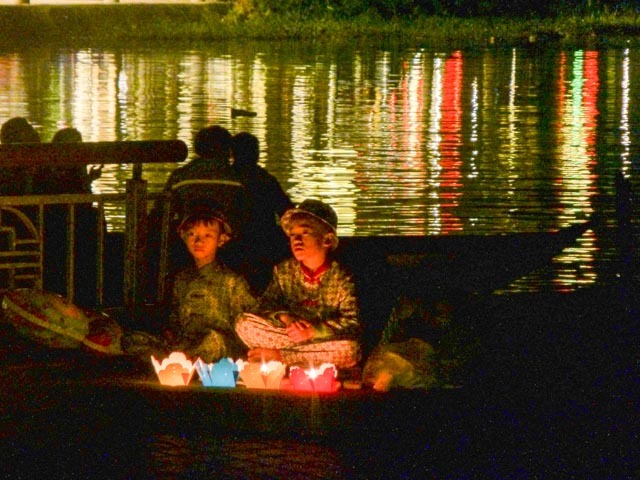 It looked like they had some sort of celebration, with lots of incense everywhere and hundreds of paper lanterns floating slowly down the river. It was raining when we woke up, so we had a lazy morning. We had breakfast at DMZ bar, where the waiter taught us some Vietnamese. It was warmer than yesterday, so we felt fine in short sleeves, and were looking forward to sightseeing in a bearable temperature. But the locals were freezing, and were wearing winter coats and large wool sweaters. Funny! Between 1802 and 1945, Hue was the imperial capital of the Nguyễn Dynasty and the capital of Vietnam. 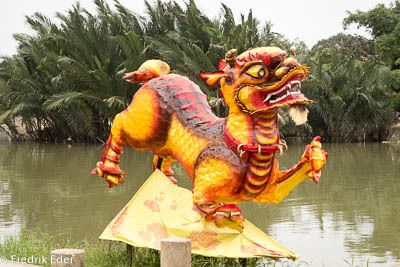 We walked over the Parfume River (named after the aroma of the orchard flowers falling into the river in the autumn) towards the Citadel, the seat of the Nguyễn emperors. It occupies a large, walled area on the north side of the river. Inside the citadel was a forbidden city where only the emperors, concubines, and those close enough to them were granted access. This area is now a UNESCO World Heritage Site, although it was considerably damaged during the Vietnam War and was neglected for a long time after the war. We found an English-speaking cyclo driver with a lot of knowledge about the area, so he and a colleague took us to a couple of less visited sights before we continued to the Forbidden City. There are seven gates to the Citadel, one for each king, and we visited one of them and were able to climb to the top for some nice views. We also stopped by Ho Chi Minh’s humble house that now had an alter with photos of him and his parents. The forbidden city was quite different from what we expected. It was built up similar to the forbidden city in Beijing, but because of the neglect it somehow felt more authentic. Since it was raining a bit in the morning there were not many visitors, and this probably enhanced that feeling. Several places we could see bullet holes in the walls, and sadly parts of the area were completely ruined during the war, but the rest was restored or under restoration. 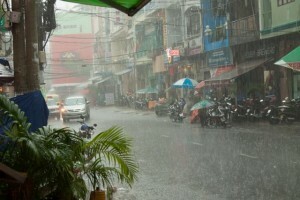 Because of the resent typhoon, it was very wet and slippery in some areas, but that was just part of the experience. 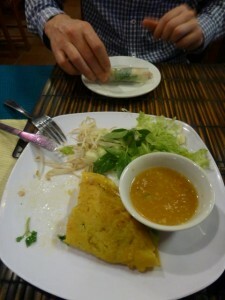 After booking a private car (and four stops) to Hoi An and a hotel there, we went to Nina’s Cafe for dinner. This was a very cosy family restaurant hidden away in the end of a small alley. Definitely not a place people stumble upon, but because of their good reputation and amazing food several people had found their way there. We had to start with a local speciality, where you roll pankakes and various vegetables in thin rice paper and dip it in a very tasteful peanut sauce. Their Chicken curry and Pork in clay pot was also delicious, and we even had some pancakes for dessert. It was a slow morning since we had a late flight to Hue. We checked out just before noon and went back to Sozo for breakfast. Since we had a few hours we walked up to the old marked and Fredrik ended up with two new shorts. At 2 pm we were picked up by a driver who took us to the airport. The flight with Vietjet (a lowcost airline) was perfectly fine for the ridiculously low price we paid. The airport in Hue was very small, and we were out of there in no time. The temperature took us a bit by surprise. It was a lot colder here than in both Hanoi (north) and Saigon (south), but after two sweaty weeks it was actually really nice. We were picked up by a nice driver, and were fascinated by how little traffic there was and how polite everyone were driving. Since the hotel was in an alley where the car could not drive in we were escorted by two young men with umbrellas (it was drizzling) to the hotel. The welcoming was warm and friendly and they served us juice, tea, coffee and fresh fruits while taking care of the paperwork. We had booked a twin room that they didn’t have, so we got a large double room with an extra bed. After changing to clothes that were suitable for the temperature (trousers and shoes! ), we went out for dinner at Golden Rice Restaurant that was highly recommended by our hotel. And what a dinner! We had Chicken in a bamboo-tube, caramelized pork and pancakes for dessert. We ended the evening with local beers and (mostly) good music at DMZ bar. We were picked up at our hotel at 8.15 AM. Our street is too small for busses, so we walked out to the main road and picked up more people on the way. Buying a cheap backpacker tour has it’s disadvantages. It took more than an hour to pick up everyone, and we ended up in a group of 23 people on a crowded bus. Lots of great people though, so we didn’t get bored, even though the trip took a lot longer than expected. On our way to the Cu Chi tunnels we stopped at a workshop where people with disabilities made and sold all kinds of art. Especially the pictures made of egg shells were impressive, but we spent our time there eating breakfast instead of shopping. We finally arrived at the Cu Chi tunnels (Ben Duoc) at 12.30 PM. They are part of a network of up to 250 km of tunnels and played a crucial role in the Vietnamese war. 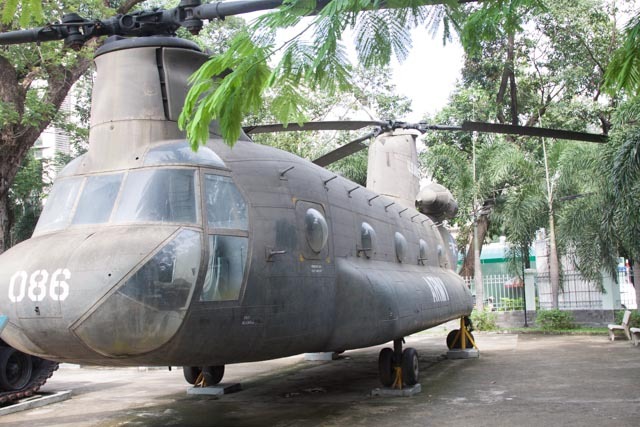 They served as hiding spots and routes for communication, supplies and escape for the Vietcong. They were too narrow for most non-Vietnamese, and were also heavily booby-trapped. While most tunnels were fairly small and simple, the major ones had three levels, and could be up to 10 meters deep. They contained everything needed, like cooking areas, meeting rooms, infirmaries, warehouses and even underwater entrances from the river. They had a ventilation system looking like ant hills, and the smoke from the cooking areas were led several kilometers away. The ones thin enough (like Fredrik) were allowed to climb down one of the original entrances to the tunnel. He had to hold his hands over his head to get in. 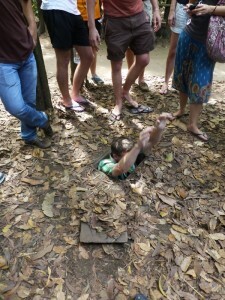 They also had a tunnel that was widened so that it was easy to get in and possible to crawl through for most tourists. If you went all the way you would exit at the fifth exit. We made it to exit number two. It was just too warm, dark and narrow down there. The sights were really interesting, but the way they had organized it was very touristy and there were way too many visitors in the park. We walked around like sheep, the group was too big for everyone to see and hear and we always had to wait for other groups to finish. It was also very focused on how smart the Vietcong were and how many Americans they killed, not about the history, the civilian sufferings and the long term consequences. Half way there even was a shooting range we could try if we wanted, so we could hear shooting in the background during our entire visit. Completely different from the Killing Fields in Cambodia where it was very quiet and respectful. We got back to the city center at 3.30 PM, and since it looked like it could start raining any minute, we stopped at one of the first restaurants we found for lunch. We ordered pizza and beer, and then the rain started. Lots of thunder and lightning and the street got flooded in no time. It was fun to sit and watch wet tourists running around, locals in ponchos pretty much continuing as before, and the restaurant across the street putting all his plants on scooters on the sidewalk for watering. Back at the hotel several employees from the places around us were running around saving floating shoes. It seemed to be a custom here to take of your shoes before entering hotels and stores. Our hotel had a shoe rack, so our shoes were safe. 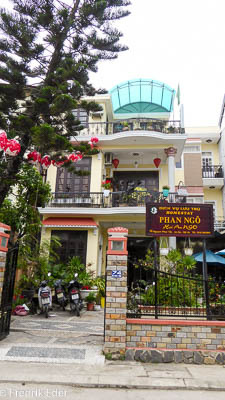 Since our half day tour took most of the day, we didn’t have time to see everything we wanted, so we booked an extra night at the hotel and also arranged a flight to Hue and booked a hotel there. We also got some other things done, like refilling our SIM card, handing in some laundry and finishing a couple of blog posts. In the evening we had dinner at Cyclo Resto, a resturant that have cocking classes during the day and serve a simple, but very good 6 course set menu for only 6 USD. The staff was very sweet and seemed so proud of the place, and we had much fun reading all the greetings written on the walls. At the end of the meal it was time for us to write on the wall as well. We both woke up when the boat started around 5 AM. Fredrik soon gave up falling asleep again and got up. He took pictures of the sunrise and ate breakfast, while Gunnhild stubbornly tried to get some more sleep. At 8 AM we had showered, packed our bags, paid the bill and were ready for another excursion. We were picked up by a small boat that took us to the Cai Rang floating market in Can Tho city. The main items sold there are farm products and specialties of the area. Sellers tie their goods to a tall pole so that buyers can see from a distance what they are selling. Larger sized boats anchor and create lanes that smaller boats weave in and out of. Small boats that sell beer, wine and soft drinks go among the other boats to serve market-goers and visitors. 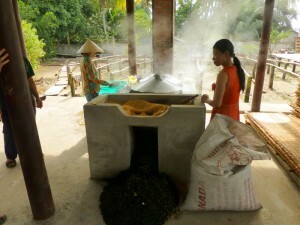 We also visited a small rice noodle factory where we got to see the whole process and to taste rice noodle cakes. 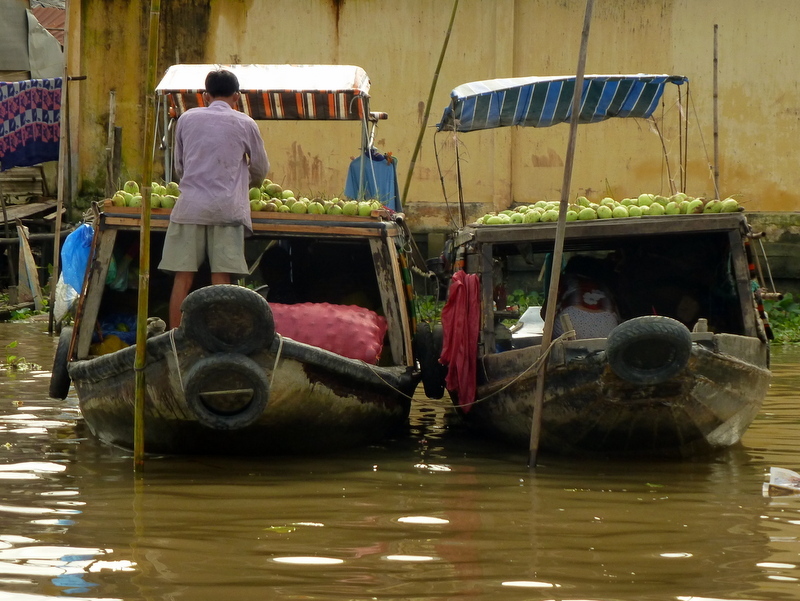 On the way back we bought fresh pineapples and a different kind of rice cake from the boats at the market. Back at Mekong Eyes it was soon time for lunch, and at 11.45 AM we were picked up by a van that took us (and two of the Germans) to Ho Chi Minh City. We checked in at PP Backpackers, where we got a large but a little bit shabby twin room with a nice balcony. 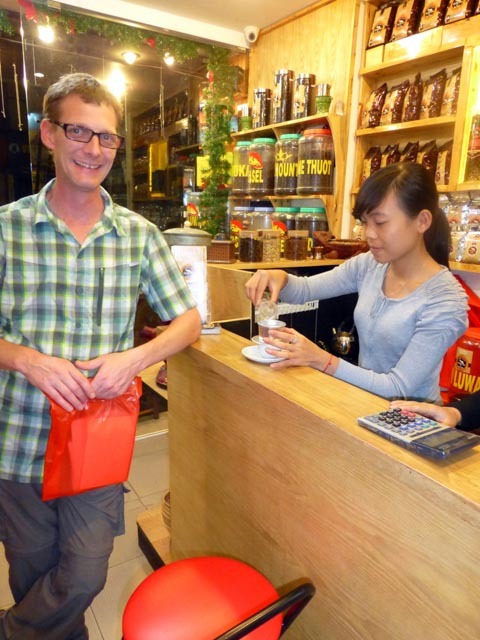 The staff was really helpful and the location was great (in a small quiet street just one block from the main backpacker street). We went for a walk in the area. It was kind of a shock with all the noise, traffic and people after quiet days on the Mekong, but it was also nice with all the options. We got to taste the Vietnamese mini-pancakes we had been recommended, did some window-shopping, and ended up up with real shopping (computer- and cameras-bags). We walked to the night market, which was a bit too touristy and a lot less impressive than the markets in Phnom Penh. So we ended our evening with a beer at the hotel instead. We got up at 6.15 AM. Gunnhild went out to buy some crackers for the road, and some tissues/handkerchiefs for Fredrik. That was a bit harder than expected, so she returned with potato chips and cute princess tissues. 😉 We were picked up by a brand new and luxorius car at 7.30 AM’ and started our drive towards Cai Be, where we would start our cruise. We expected small villages, farmland and small roads, but were surprised to also drive through large citys, over fancy bridges and pass big factories. In this area we also saw more churches than temples. 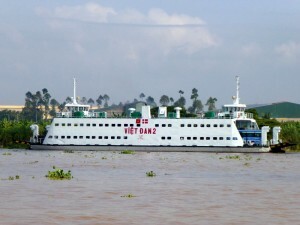 At one point we took a ferry across the river, and it seemed to be imported from Denmark since it was named VietDan and had a Danish flag on the side. We arrived in Cai Be at 11 AM, and were welcomed at the dock by several very friendly guides, but with difficult Vietnamese English. We arrived a bit early, so one of the guides offered to take us to the local market instead of just waiting, but we politely declined. Instead we watched large groups of tourists going on sightseeing trips on the river. A German couple going on our boat was a bit delayed, but finally we all got into one of the sightseeing boats that would take us there. 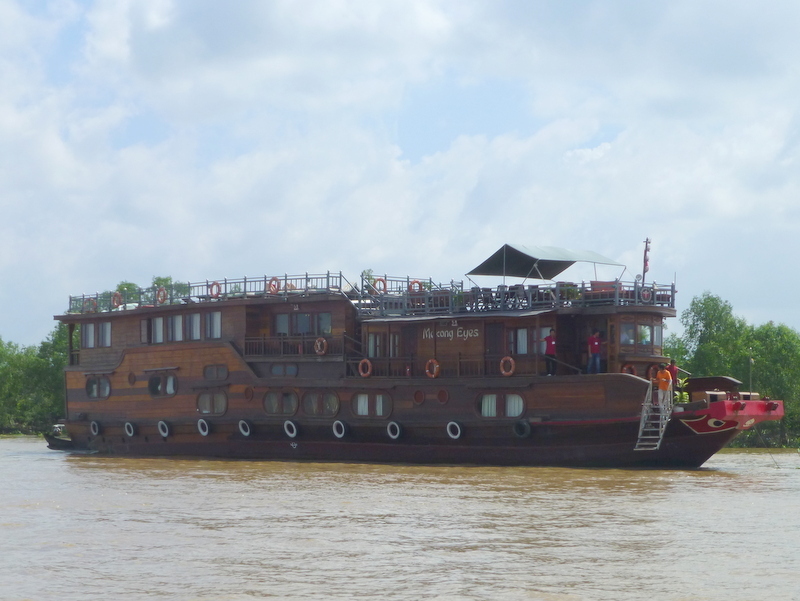 We were welcomed onto Mekong Eyes, and after some juice and information we were showed to our cabins which were nice and with huge bathrooms (for a boat). Mekong Eyes have cabins for 16 passengers, but we were only 8 and would have plenty of space. We were served a 5 course brunch in the restaurant at 1.15 PM, and then had a beer with the others (2 from Australia and 4 from Germany) on the sun deck. All great people! We had a little bit of rain in the afternoon, which gave us time to unpack and do a little bit of blogging. But by 4.30 PM the rain had stopped, so we all went a shore to visit a small village (pop. 1200). We saw all the different types of fruit they where growing, a farmer planting rice, school kids on their way home etc., and in the only store we saw, we were able to refill our Vietnamese SIM card. It was really hot and humid, but still we sat down for a cup of hot tea (!!) 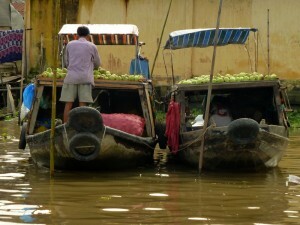 and some fresh fruit before going back to Mekong Eyes. Besides the 5 course dinner at 7 PM, the rest of the day and evening was spent on the sun deck watching the life on the river, getting to know the others, sharing travel stories and drinking a few beers. Great night!